Bravo! began after a meat business was started in 1942. The expansion into raw and natural ingredients for pet food based on the products the company already made was added later. The company boasts natural ingredients and antibiotic-free poultry ingredients. Some of the products are said to have no more than 5 ingredients. Bravo! recently underwent a branding redesign, which includes a new logo and updated packaging. Has Bravo! Ever Been Recalled? Yes. 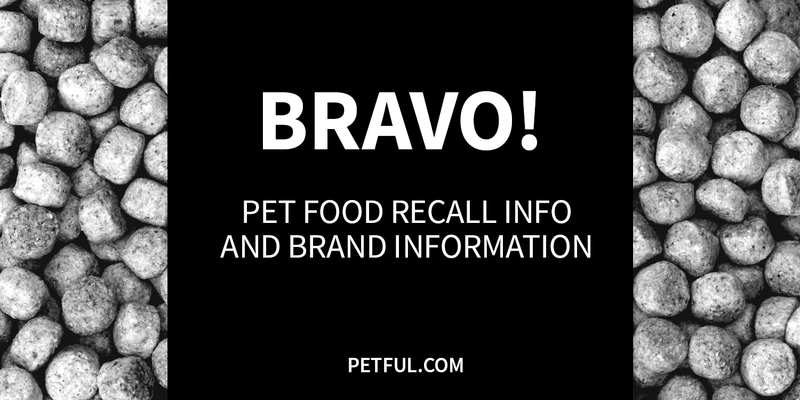 In July 2015 and December 2015, Bravo recalled a few of its chicken-based foods for dogs and cats because of the potential for salmonella contamination. Products were recalled twice in 2014 over concerns about salmonella and listeria. Our research also turned up a recall for that reason in fall 2007. In addition, some pig ears made by Bravo! were pulled from shelves in summer 2011 — can you guess the reason? That’s right, salmonella concerns again. Withdrawn: All sizes (2 lb., 5 lb., 10 lb.) 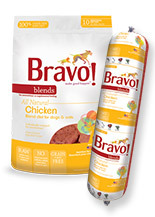 of Bravo Chicken Blends, Bravo Turkey Blends, Bravo Balance Chicken Balance and Bravo Balance Premium Turkey Formula frozen raw diet products with “Best by” dates between June 20, 2016 and Sept. 18, 2016. Cause: Potential for salmonella. Announcement: FDA report dated March 13, 2013. What was recalled: 2 lb. chubs (tubes) of Bravo! Raw Food Diet Chicken Blend for dogs and cats, with the following codes only: Product Code #21-102, Batch Code #6 14 12. Cause: Potential for salmonella. Announcement: FDA report dated June 3, 2011. What was recalled: Bravo! 50-count bulk Oven Roasted Pig Ears, Product Code #75-121, Lot #12-06-10. Have You Had a Problem With Bravo?